In this post, we will discuss if a blade is worth re-sharpening, or is it too damaged to be fixed or sharpened. We will also discuss the different parts that make up a blade and what to look for. It will help you determine whether or not a blade is good or bad. The comb is the top blade of the blades set. This is the most important part of the blade. It determines the height of the cut and has two styles, full tooth and skip tooth. The cutter is the most important part of a blade as it is this blade that does the cutting. It is moved back and forth by the clipper lever. On the cutter, all the teeth must be present. If they are chipped, blunt or even broken they may not work and just catch and snag or even cut the dog. There are also ceramic cutters. These are basically glass cutters. Ceramic blades should only be used on a clean and well-brushed dog. If both of these cutters are missing teeth or have broken ends, these cannot be fixed so will have to be replaced. There is also a cutter rail that is on the underside of the comb blade that isn’t seen very much. The rail will keep the cutter raised enough to give the hair that being cut a way to move out of the way. If this rail is ground flat then the blade is no good and cannot be fixed. If using a #40 blade and there are teeth missing, this is up to the groomer to use this or not. If it has ONE missing tooth, it will barely cause a line and may never cut the skin. If there are several teeth missing, this is a dangerous blade and should not be used and cannot be fixed. 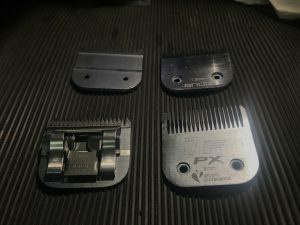 If using a blade larger than #40, a lot of groomers will use a blade with the very outside tooth missing as 95%+ of the blade is still good and may not cut the skin. If there is teeth missing in the middle this will cut a line in the coat and may cut the skin. If blades are missing a tooth or teeth, these cannot be fixed or repaired. If the rail has been ground flat on the comb blade, then the blade will drag or snag in the coat. The rail gives the blade space so there is room for the hair to move out of the way. If there is no rail at all the blade will no cut. The comb blade cannot be fixed or repaired, so will have to be replaced. Check into a good blade care program and use oil as a lubricant. When the cutting surfaces ( the rails ) are dry they will dull out in a few weeks, using blade oil could keep the blade sharp for months. The less you have the blade sharpened the more rail you will save, and the blade won’t have to be replaced for a long time.